Greetings again from the darkness. This feature film debut from Texas filmmaker Jameson Brooks (co-written with Sheldon Chick) was an Audience Award winner at last year’s Dallas International Film Festival. It’s based on the incredulous true story of a tragic crime and the subsequent trial that occurred in Amarillo in the late 1990’s. It’s also an introduction to a talented and exciting filmmaker with a message that is as every bit as important now for every community as it was 20 years ago in the Texas panhandle. The courtroom scenes serve as the story structure while flashbacks are blended with the defense attorney (Glenn Morshower) commenting/mocking the evidence as it’s shown to the jury. This style keeps those unfamiliar with the story uncertain as to the actual victim and the circumstances of the crime – at least until the final act when we see a re-enactment of the crime and the final day of trial. However, even if one is familiar with the specifics of the case, it is presented in such an exceptional manner that it will surely be just as impactful. 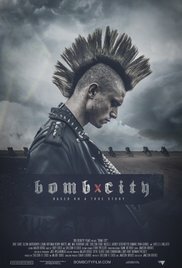 Keeping in mind that this is west Texas (remember “Friday Night Lights”) and football reigns supreme, so the ongoing battle between the Punks and the Preps sets the stage for ultimate cultural battle … especially in an area that is home to a nuclear bomb assembly plant. Volatility abounds. There is a terrific sequence with parallel cuts between the mosh pit of a local punk rock concert and the on-field violence of a local high school football game. There are more similarities than differences, well, until the kids from the two sides cross paths in the real world. Class differences are obvious, and so is the usual teen angst and rebellious nature. Distinct differences in how the authorities handle each group’s form of release are on full display. The punks are caught tagging, while the pasture party of the jocks gains frenzy. One of these ends with handcuffs, and the other with polite dismissal. The core of the story is the ongoing comparison between Brian (in a wonderful performance from Dave Davies), sporting a colorful Mohawk as he skateboards through town, and Cody (an effective Luke Shelton), a buttoned-up football player always striving to prove his mettle as he cruises around town in Daddy’s Cadillac. A sense of doom-filled destiny accompanies their scenes, and of course, we know it won’t end well. Many will find the film reminiscent of Frances Ford Coppola’s 1983 film THE OUTSIDERS, which featured the Greasers versus the Socs. The biting realism and grit of Mr. Brooks’ film helps us better understand the similarities between the two groups who look so different. And that’s the real message here: judging others by looks will never lead to understanding and peaceful coexistence. The cinematography of Jake Wilgonwski is a huge part of the emotional reaction we have to this story, and the notes provided at the end of the film leave us wondering if, 20 plus years later, we are any more advanced as a society than what occurred in that Amarillo parking lot. This entry was posted on Thursday, February 8th, 2018 at 8:30 pm and is filed under Drama. You can follow any responses to this entry through the RSS 2.0 feed. You can leave a response, or trackback from your own site.